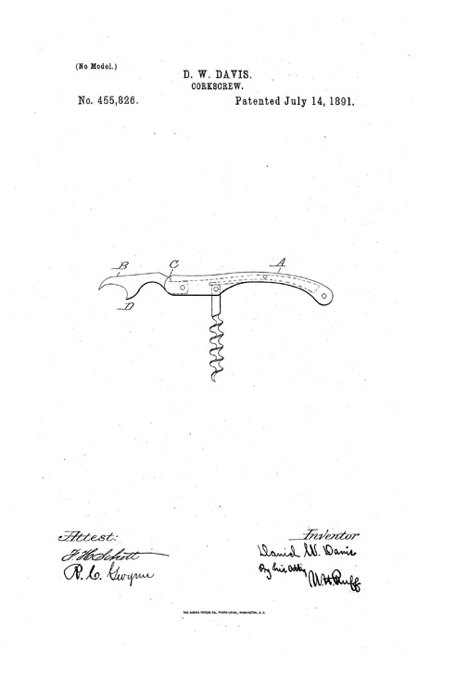 David W. Davis, in his July 14th 1891 patent description, describes his corkscrew as being “perfectly-equipped,” and in short order Davis’ implement would become even more perfectly-equipped as he began to combine the July 14th patent (number 455,826) with a patent he was awarded only seven days earlier (number 455,610) for his Pocket-Knife. Functioning with a fulcrum-lever mechanism, Davis’ corkscrew is indeed both simple and efficient. 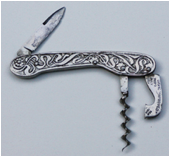 And, the variations that have been unearthed, as well as the wide variety companies that chose the Davis corkscrew as a vehicle to advertise their wares, beverages, or establishments, have made the Davis a mainstay in many of our collections. And, for some of us have led to small collections within our collections. Beyond various advertising that appears on the Davis corkscrews, which will be dicussed later, there are two markings that generally appear on the Davis; THE DAVIS CORK SCREW PAT. 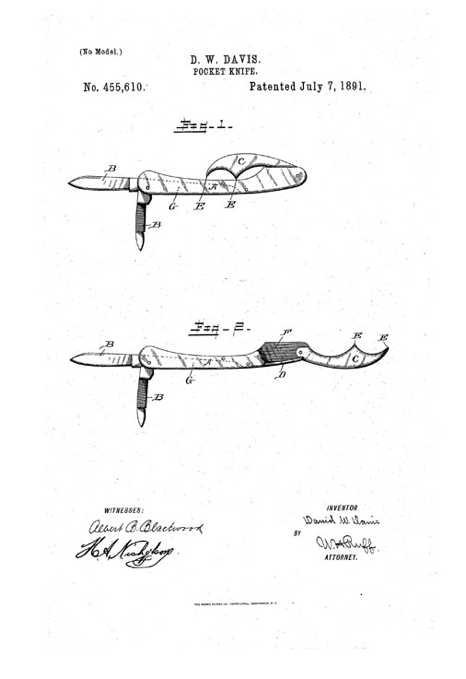 JULY 14, 1891 and the Davis with knife blade THE DAVIS KNIFE & CORKSCREW PAT’D JULY 7 & 14 1891. 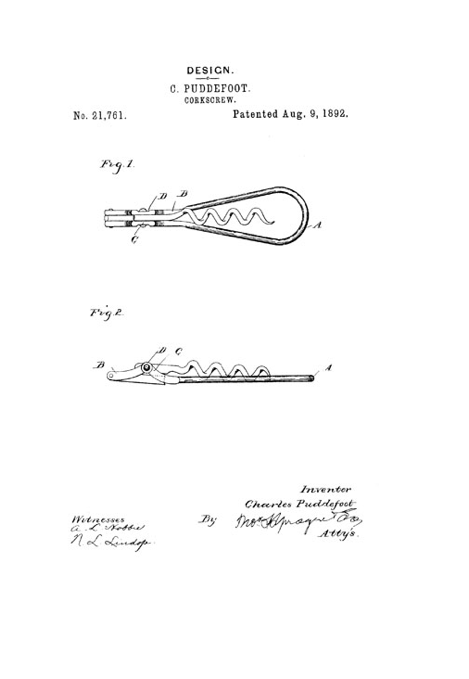 As we have seen, there is a transition between Davis’ corkscrews and 1894 when Puddefoot’s patent is being produced with ‘The Detroit” marking on the neckstand. And, during this period we see the Davis with a wider Puddefoot-type neck stand, with the marking of DAVIS IMPROVED PAT’D JULY 14, 91 OTHER PATS PNDG. 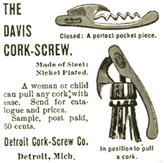 In a February 4,, 1893 issue of Metal Worker, it is reported that the, “Detroit Corkscrew Company, Detroit Mich, are manufacturing a line of corkscrews…” and, this same issue provides images of the Davis corkscrew with knife blade, the Davis corkscrew as being used to cut wires on a bottle, and an image of Puddefoot’s earlier corkscrew patent. 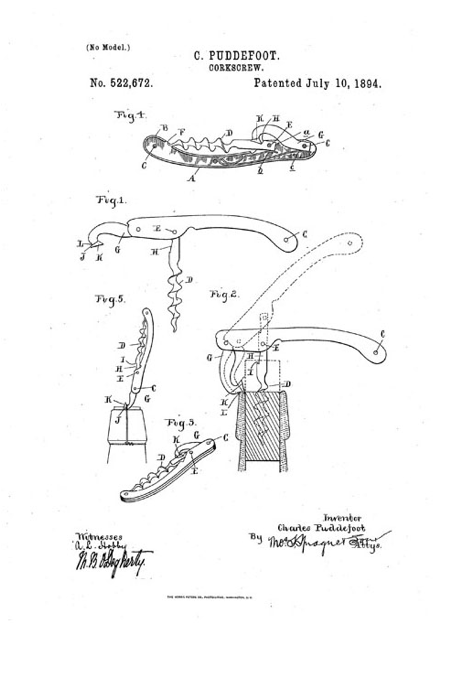 On August 9, 1892, Puddefoot was awarded patent number 21,761 for his Design for a Corkscrew and on July 11, 1893 number 501,468 for a Corkscrew which was assigned to the Detroit Corkscrew Company. How Puddefoot initially became involved with Davis is still unknown, however in 1889 there is a reference that explains Charles Puddefoot was the Superintendent at the Detroit Stamping Company. And, in 1895, it is reported in the Michigan Gazetteer that the building which housed the Detroit Stamping Company located on the corner of Champlain and Beaubien Streets was destroyed by fire. That March 9th article, lists among the other tenants at that building none other than the Detroit Cork-Screw Company. One of the most useful novelties ever introduced among the drug trade is the Davis Corkscrew, made by the Detroit Corkscrew Company, Brush and Champlain Streets, Detroit, Mich. As a decided improvement over the old style cork screw it has few equals. It is a perfect pocket piece, made of steel, nickel plated, and works with such ease that a woman or child can pull corks which require the strength of a pugilist to extract with the old style screw. Several styles of screws are made by the company, but the ‘Davis’ is the most complete. With it you can cut the wire on the neck of a bottle, extract the cork with little exertion, and sharpen pencils with a strong steel knife blade attached. The screw is illustrated in the company's ‘ad’ in this Issue. A second screw, without knife, is a handy little device, also. The company are now supplying this style to the Welch Grape Juice Co., Greenway Bottling Co., Pabst Brewing Co. and other large bottlers, who have their trade mark stamped on them, and give them away as advertisements. For such purposes they are cheap and very desirable. Many large orders are being received from jobbers. The Columbus Power Corkscrew, the Straight Shank Cut Worm Screws, Greely's Cork Extracter and the Puddefoot Power Screws are also made by the company. They have an exhibition of their goods at the World's Fair and at the home works are turning them out by the hundreds. Retail druggists would do well to bear in mind these useful articles, and place an order for them at the earliest opportunity. Mention the ERA when writing. 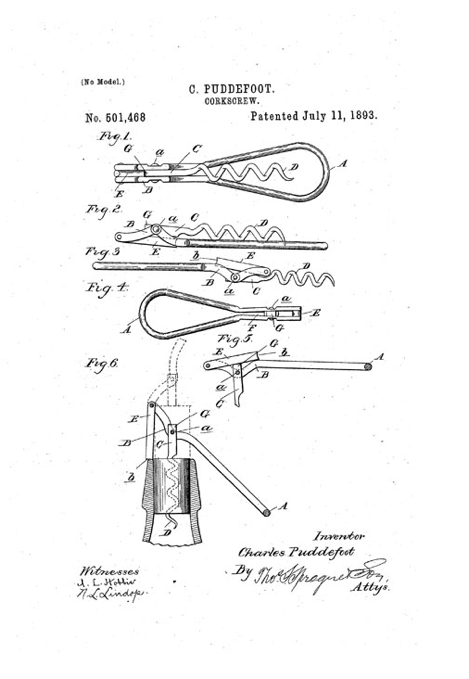 Of course, we have seen many other bottlers, brewers, manufacturers, and establishments who saw the advantage of utilizing the Davis and later Puddefoot’s 1894 corkscrew patent, number 522,672, which is marked on the neckstand THE DETROIT, PAT’D JULY 10 94, as a vehicle for their advertising. And, in the 1894 patent, we see a similarity to Davis’ Improved neckstand, but with a narrower design. Perhaps Puddefoot’s 1894 patent is the OTHER PATS PNDG that we find on the Davis Improved. As mentioned in the Pharmaceutical Era issue, there were several bottlers advertising on the Davis, these included Welch Grape Juice Co., Greenway Bottling Co., and Pabst Brewing Co. And, while the list below is by no means complete, the following are the advertisements on the plain Davis and The Detroit corkscrews in the collections of John Morris, Barry Taylor, and my own. Of course, there are rarer variations of the The Detroit, Davis, and “Davis Improved” out there as well; fancy decorated leg with garter, plain leg, mermaid, decorative embossed handles, Sterling handles, and those that were souvenirs from the Columbian Exposition. Many of these variations are pictured below, following this brief overview, and I have no doubt that there are still others that are in your own collections. 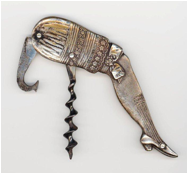 As with many corkscrew stories, a corkscrew’s history is difficult to trace. We can find references to a maker or manufacturer, patent drawings and descriptions, and sometimes some biographical information. Still in many ways the hunt for this information can be as satisfying (and occasionally as frustrating) as the hunt for the corkscrews themselves. For this reason, the story is yet complete, and it will remain a work in progress, as I continue to hunt information that explains how Puddefoot and Davis came together to create the corkscrews of The Detroit Cork Screw Company. I would like to thank John Morris, Barry Taylor, and Bert Giulian for sending in photos for this article. 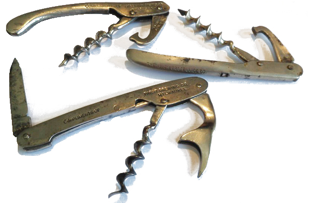 Surely there are other variations that you each have your own collections, and if you are so inclined, feel free to send me pictures at josef@vintagecorkscrews.com, as I will continue to research the corkscrews of the Detroit Cork Screw Company, David Davis, and Charles Puddefoot. Unusual Davis marked THE DAVIS CORK SCREW PAT’D JULY 14, 1891, but a solid metal neckstand—perhaps a machine shop project? Davis with Blade marked THE DAVIS KNIFE & CORKSCREW PAT’D JULY 7 & 14 1891, with advertising COMPLIMENTS OF PABST BREWING CO. MILWAUKEE. Rare example of the 1892 Puddefoot patent, marked PUDDEFOOT and on side of the neckstand and on the other PAT'D AUG.9.92. If you have one of these, I am still on the hunt for one! Decorative handle Davis Improved, marked DAVIS 'IMPROVED' PAT'D JULY 14 91, OTHER PATS. PND'G - unusual, as this has a knife. An unusual Puddefoot, unmarked on the Puddefoot neckstand. It also has a knife. If you have a Detroit, Davis, or Puddefoot corkscrew with which you would like to part, I will gladly buy it (or trade for it).